I think as time went by that design turned to be less liked by enthusiasts. But I think 964 fans are lucky to be spared from 993 rear which has it's own problems that are not easy to deal with. Maybe the ERP spring plate is not made of spring steel like the OE piece? The threaded portion welded to the plate (where the rod-end attaches) would definitely minimize any potential flex points on the spring plate. 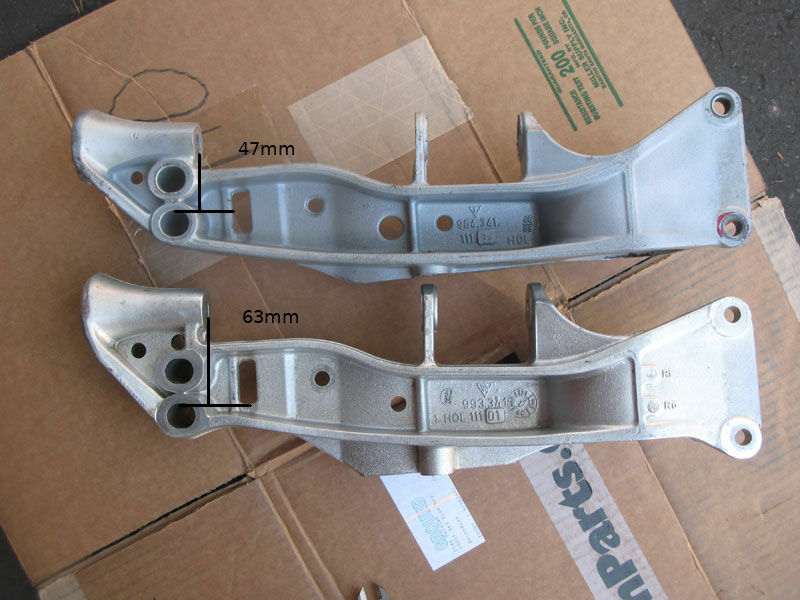 I am trying to find out if I can replace wheel carriers on my 964t/3.3L (96534165619) with 993 ones (99334115803). Can someone help? What modifications are needed? 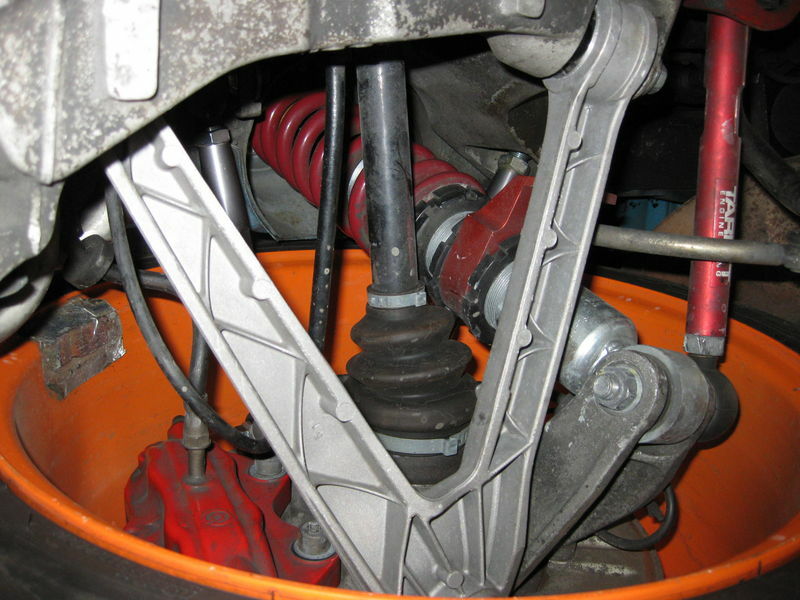 Yes you can however you will need to replace the tie rods complete to the 993 version and use 993TT front rotors. I believe you may need to switch over to the 993 style toothed gear and sensors for the ABS as well but it might be possible to retrofit the 964 ones but I don't know for sure. Interesting the 993 aluminum carriers are around $400 new ea the 964 turbo units are around $1400 new ea. I would save the old parts. Last edited by Cobalt; 11-30-2015 at 11:09 AM..
You will need to use 993 ball joints. By far the more usual path is to use the 993RS wheel carriers w/ 993RS tierods which allow the car to be lowered more than the 964 or 993 ones. 2. Machine 1mm wide washer to go between 964 knurled bolt & 993 ball joint. Here's a narrowbody 964 RS running the longitudinal mounts in the widebody (Turbo) position. Interesting restoration. The cup cars used the outer mountings for more camber? Why would they not undercoat the wheel wells and undercoat the tub? Some steering rack measurements to add to this excellent thread. Despite the Porsche TSB, the 993 rack will fit in the 964 C4 with zero problems. I can only guess that Porsche said that it wouldn't fit, because you need to remove the subframe longitudinals first in order to angle the 993 steering rack in to position around the C4 diff. Just as the tech specs say, the 993 rack is faster. Anyone know of a spherical inner tie rod replacement for the stock 964 inner? 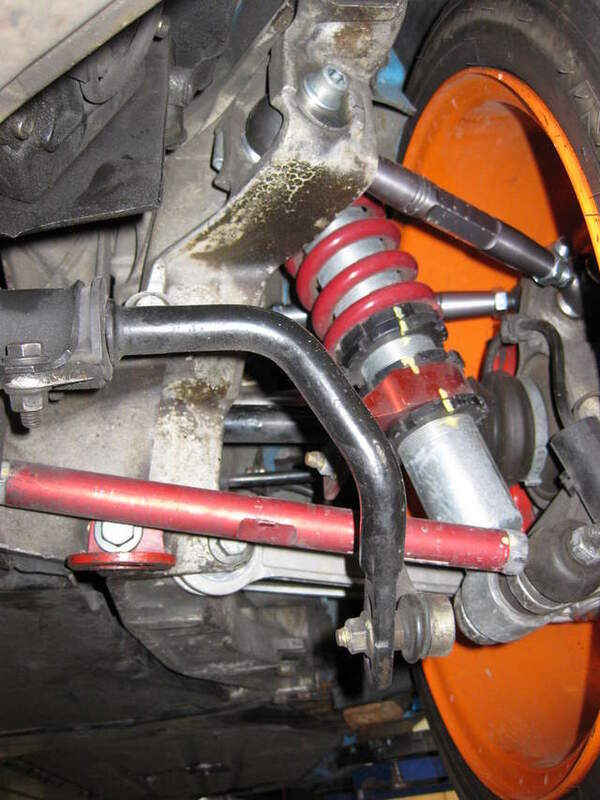 Seems that Porsche is a bit unique having rubber damping/isolation on the inner tie rods. Last edited by perelet; 05-14-2017 at 01:19 PM..
Can 1996 993 C2 Eibach Springs fit a 1990 964 C2? Everybody, I still have all original pics. If board admin can help to host pictures and fix links. Please IM me with ID if admin to talk to.i don’t login here too often. I restored links on my personal server, but wish somebody can help to restore this thread here on pelican. I IM'ed several moderators from links no replies so far. Last edited by perelet; 11-17-2018 at 06:40 PM.. I measure a 16mm offset between the 964 and 993 longitudinals. The 993 longitudinals push the front wheels outboard 16mm compared to the 964. I also measure a 3.5mm difference between the ball joint stud hole and the upright wheel bearing front face. This moves the 993 upright 3.5mm inboard. Swapping the 993 uprights into the 964 not only pulls the wheels 3.5mm inboard, but also reduces the available negative camber because of this offset. This all turns into 25mm increase in the front track of the 993 through these parts. 25mm= 2*(16-3.5). Last edited by nickd; 03-04-2019 at 01:55 PM..
Are you sure of that? I have the 993 longitudinals on my 964 WB IIRC it was only a 12.5mm difference. This is what I get. Did you change uprights at the same time? How did you measure the 12.5mm? Also, did you use camber plates to push the strut outboard and maintain camber?